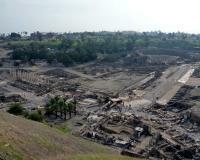 Bet She'an is part of the Tentative list of Israel in order to qualify for inclusion in the World Heritage List. Our visit to Israel/Palestine uncovered many places of interest of which we had not previously been aware but the remains of the city of Beit She’an was perhaps the most impressive. We have been to most of the numerous inscribed excavated “Roman cities” but this was a “cut above” most of them. Furthermore, beyond its “Roman credentials” it also has a “Biblical” (and pre-Biblical) Tell and Egyptian remains from the time of Thutmose II (1500 BCE) when it became an admin centre for the Empire for around 300 years. It also survived beyond the Roman period as a successful Byzantine and largely Christian town through to the Arab conquests and an earthquake in 749 CE. It was a very pleasant place to wander around and, in our experience, free from the “Holy Land Hordes” who make visiting places closer to Jerusalem quite a hassle. The site is spread out and we gave it a bit over 2 hours during which we felt we covered it reasonably thoroughly. It contains the usual Roman structures – Theatre, Baths, Agora, Temple, Nymphaeum and several paved streets. There are some nice mosaics – the most iconic of which, a Byzantine representation of the Roman goddess Tyche who traditionally was “Guardian” of the city, was stolen from the site in June 1989 so that only a replacement copy is on view. At the far end is the Tell. At the top there are a few excavated remains whose nature isn’t really very clear and some (copies?) of Egyptian carvings. There are definitely originals in the Rockefeller Museum Jerusalem. As an aside I make a recommendation here for people to visit that museum and not just the main “Israel Museum” (of which it is now organised as a sub-unit). Israel seems to regard it somewhat ambivalently as the “Museum of East Jerusalem”/”the Mandate” etc but it is a fine museum building from the 1930s and still contains some fine exhibits from Israeli inscribed and T List sites as well as those of Palestine (even though some, of which the most famous were the Dead Sea Scrolls, have been removed). The fact that visitors are advised to wear warm clothing in winter as there is no central heating gives an indication of the sort of grudging support which Israel gives it – you will have its wonderful halls almost to yourselves and FREE ENTRY! However, the main reason to climb Beit She’an’s Tell is for the very fine view over the entire site to be obtained from there (photo). I visited this site in December of 2006. it was awe-inspiring. you walk from the visitors centre, and suddenly, unexpectedly, this massive roman city opens up before you; with a huge tel (hill made of archaeological remains) in the background. It is the biggest roman city in the middle east, and the part that you can see, and walk around, is only the downtown. 2000 years ago, the city sprawled over where the modern city is today. i was told a story; about a person renovating his garage, and finding a roman mural under the floor. the are several distinct sections; there is the theatre, the bathhouse, the cardo (main street), the tell, and several side streets. on top of the tell are the remains of a temple. the view from the tell is great, as you can see the entire city. there are many, many steps to get on top of the tell, and it is not for those who aren't fit. this is a magnificent site, a beautifully day/ or half day, trip from tiberias. this is in my opionion; worthy of inscription in the world heritage list. Bet Shean used to be the most important city in the Decapolis - an alliance of 6 Roman cities in the Levant. It was additionally the largest Roman city in the Levant. The city is only partially explored, but what has been revealed is quite impressive with mosaics, a theatre, an amphitheatre, an indoor market, a bathhouse and the like. Next to the city centre is a classical tell with multiple earlier layers. Atop it you can enjoy a great view of the site and also explore the remains of an Old Egyptian residence. The site is of definitely of international standards and favourably compared to many similar Roman sites. Nonetheless, the chances of another Roman city being added to the list are justifably slim.